Weight Capacity: 4.4 Lbs. - 330.7 Lbs. 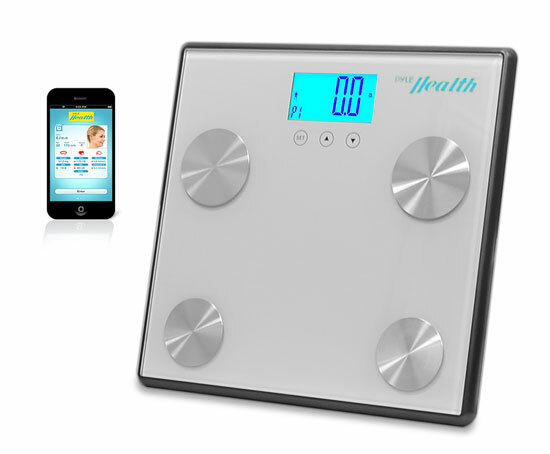 Train smarter with the Pyle Health Bluetooth Fitness Scale and Application. Change the way you keep track of your exercise routines and literally see the results. Download the free ‘Pyle Health’ Fitness Tracker Application and you’ll be able to wirelessly transfer your data. Use the Pyle Health App to create a profile and from there you can chart your progress with the integrated calendar and retrieve your history. You can even choose to share your stats via Facebook and Twitter – or password protect your profile and keep it confidential. The Bluetooth SMART Scale communicates with your Smartphone to digitally measure your body fat, hydration, muscle and bone levels. Simply Step on the scale and chart your progress. You’ll find each workout more enjoyable and become more motivated when you can see and feel the results. Set your goals, achieve them and learn more about your body with the Pyle PHLSCBT4 Bluetooth Fitness Scale. Application supports iPhones, iPads, and iPad Mini (Compatible with iOS 6 & Later) and also supports Android Samsung Galaxy S4, Nexus 7 (Compatible with Android 4.3 & Later). After reading a nice write-up on USA Today, I ordered this scale. My readings have fluctuated over 5lbs with each measurement. I want a scale that is precise, and this isnt it. Where (what country) is this scale made? Is this scale compatible with Apple Health Kit? What is the pairing code for the bluetooth? I cannot find it in the manual and I have tried 0000 and 1234 which is normally the default when not supplied.Thanks! When I try to pair with my Android it requests a password. What is the Password? how do I transfer the data to my new iphone?